Posted on 01/02/2018 by Mickey McCarter	in Live Review and tagged Amber Rubarth, American Folk, folk, Joe Purdy, soundtrack, The Hamilton. Amber Rubarth and Joe Purdy teamed up for the soundtrack to the independent film American Folk, in which they also star! The film and soundtrack are due on Jan. 26, and — even better — Amber and Joe are visiting The Hamilton to play their songs on the American Folk Tour on Tuesday, Jan. 30. American Folk follows the story of follows Elliott (Joe Purdy) and Joni (Amber Rubarth), two strangers whose fates become intertwined after their plane is grounded in Los Angeles following the 9/11 attacks. 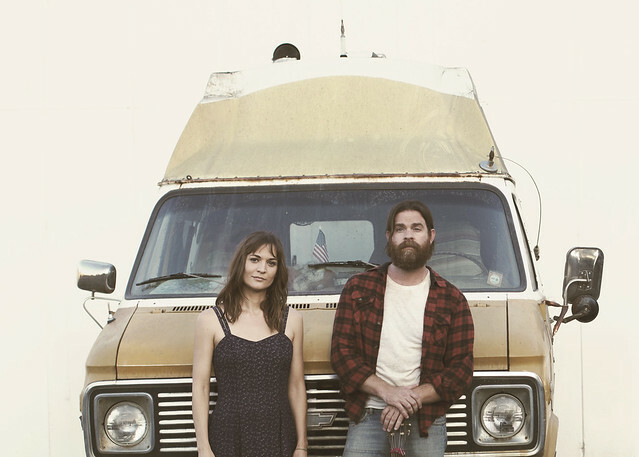 Both are folk musicians desperate to get to New York City, so they pool their resources in a cross-country journey in a 1972 Chevy Van. The resulting adventure was filmed in 14 states over 3,500 miles as the musicians find comfort in classic folk songs and the everyday people they meet on in their travels. For the movie soundtrack, Amber and Joe recorded new songs like “Townes” as well as “Someone Singing with Me.” They also recorded traditional favorites like “Red River Valley,” “Pretty Saro,” and “Oh Shenandoah.” You can hear these songs in more during their show at The Hamilton. You can buy the movie American Folk online through iTunes, and enjoy a thoroughly immersive musical experience by seeing this charming folk duo take their road songs to the stage. Buy your tickets online.